System 1 is fast, intuitive, and emotional; System 2 is slower, more deliberative, and more logical. 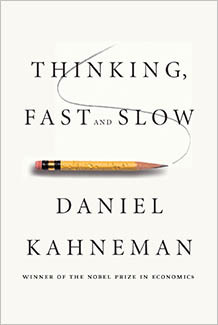 Kahneman exposes the extraordinary capabilities—and also the faults and biases—of fast thinking, and reveals the pervasive influence of intuitive impressions on our thoughts and behavior…Kahneman reveals where we can and cannot trust out intuitions and how we can tap into the benefits of slow thinking. This book distills a lifetime of work in a way that is readable, entertaining, highly informative, and incredibly important. I won’t review the book’s contents here, but want only to mention one notion in particular that caught my attention in the last few pages. Kahneman describes organizations as decision factories. More fundamental and important than any other activity that goes on in organizations of all types is the making of decisions. A company that manufactures clothing, a government body that enforces policy, a hospital that cares for the sick, and a non-profit organization that feeds the homeless are all decision factories. How well they do what they do depends on their ability to make good decisions. How many organizations take this part of their work seriously and develop the skills to do it well compared to the thought and preparation that goes into manufacturing, enforcement, health care, or food distribution? How seriously does your organization take the quality of its decision making? Our universities ought to teach decision making, both in general and in ways that are specific to each discipline. Organizations should create cultures of decision making to promote ongoing development and a greater appreciation for the process, which can be controlled, rather than the results, which are often a matter of luck. I love this notion that the primary products of any organization are its decisions. Information visualization can play an important role in this process, but it is only one competency among many that are needed to improve our decisions. We who focus on information visualization will get better at what we do as we develop these other competencies as well. Reading this book will help.